Low intermodulation design and optimized return band prevents high cable modem signals from affecting forward band transmission. 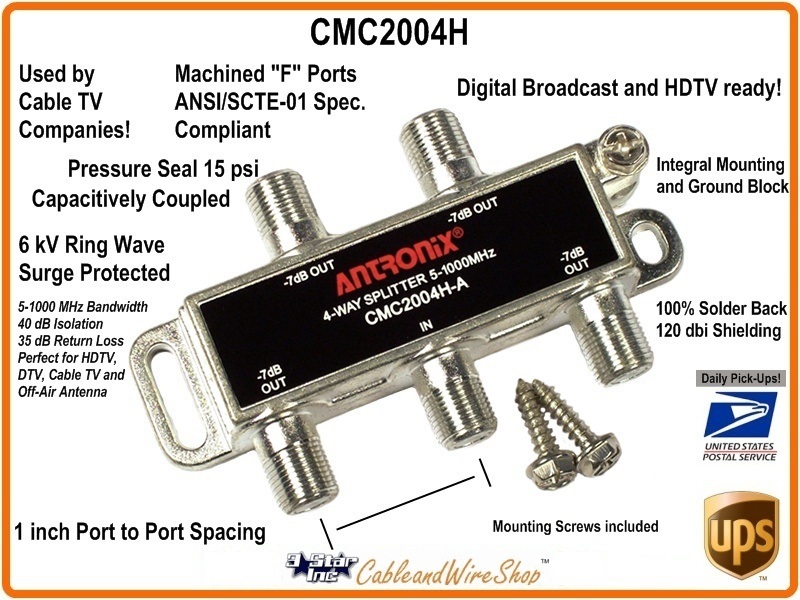 Reliability, quality and performance define the Antronix CMC2000 series digital Splitter The horizontal digital Splitter Has been designed specifically for today's two-way Broadband networks. Low intermodulation distortion and 40 dB port-to-port return band isolation prevent high power cable modem signals from distorting neighboring port signals. Capacitively coupled F-ports block AC surges and prevent hum modulation. Additionally, the digital Splitter Is among the most robust in the industry. Every port on each CMC2000 series Splitter Is 6 kV ring wave surge protected, while proprietary ferrites remain ultralinear following several surges. To ensure years of reliable performance, Antronix's digital Splitter are encased in a Zinc Alloy diecast housing with Nickel Alloy plating. The Splitter Ports are sealed to 15 psi and SCTE compliant with 1 inch spacing. The CMC2000 series digital Splitter employ high Q surface mount technology (SMT) components, guaranteeing consistent performance over time and temperature. The CMC series digital Splitter Is ideal for present and future multimedia applications including video, telephony, and transmission sensitive digital signals such as QPSK and QAM data. Ideal for digital and cable modem applications with high surge resistance and unique plating for unmatched corrosion resistance to withstand harsh environments. Note: When a Major Cable TV Manufacturing company comes out with a New item, it's a Big Deal. It has everything that the big Cable TV Companies and the SCTE Engineers have asked for; and this is it. Antronix has secured its place in the Market with this 1 GHz 2-Way Splitter The Center Conductor Seizure Mechanizm and Transient Voltage Protection are State-of-the-Art. This is the same Splitter That the Big Cable TV Companies use. It will pass Forward and Return signals; making it perfect for Splitting Cable TV with High-Speed Internet Connection Signals. The Solder Sealed Casing and Voltage Protection also makes it suitable for splitting HD TV Antenna Signals as well. The Flat F Connector ends means that the connection to the RG coaxial cable you use (RG6 or RG11) is solid, secure and doesn't slip or back off after tightened with appropriate force (most Coaxial Cable Manufacturers specify in inch/pounds). When making RG6 or RG11 cable connections outside, a weather boot covering and some sort of Silicone compound are highly recommended.